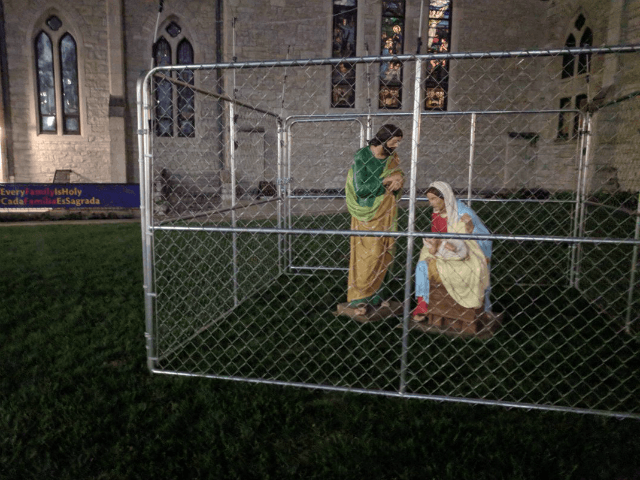 Christ Church Cathedral constructed a cage made of a chain-linked fence on its lawn overnight and placed statues of Jesus, Mary, and Joseph inside it to represent Christ and the Holy Family being detained by immigration authorities. “On our lawn tonight we placed The Holy Family…in #ICE detention,” the church tweeted Wednesday morning. Rev. Stephen Carlsen, the church’s rector and dean, told the Indianapolis Star that the display was meant to serve as a protest to Trump’s policy of housing illegal migrant families in detention centers for illegally crossing the United States border. Rev. Lee Curtis, who also presides at the church, said the display was his idea and argued that the Holy Family sought asylum in Egypt. The Episcopalian church also tweeted Sunday that it is praying for “families separated at the border,” making its stance on immigration clear to all its worshipers. But not everyone is in favor of the church’s stance on immigration. One woman called the display “offensive” and not representative of the churchgoing population or the city of Indianapolis. The churches have rules, so does our country. Follow them. Not representative of the city or church goers. Not what people come to indy to see. Offensive. I'm not sure why anyone would go to this "church". You should be ashamed of yourselves and pray for forgiveness.